"We found there are multiple atmospheric compositions that allow it to be warm enough to have surface liquid water." "This makes it a strong candidate for a habitable planet." 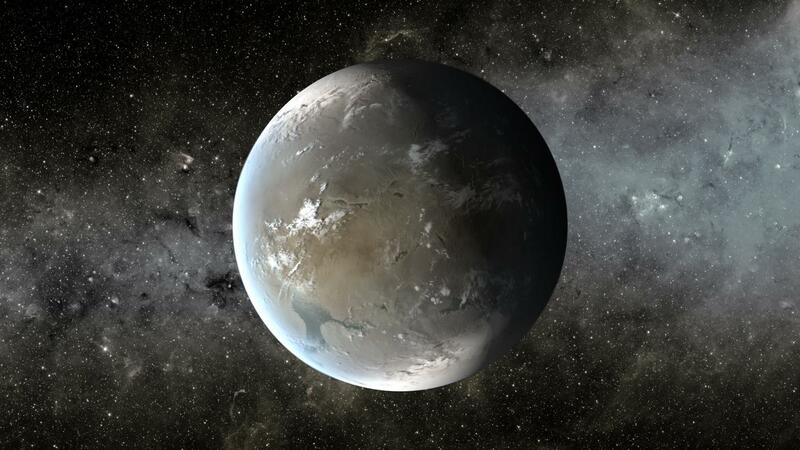 A distant planet known as Kepler-62f could be habitable, a team of astronomers reports. The planet, which is about 1,200 light-years from Earth in the direction of the constellation Lyra, is approximately 40 percent larger than Earth. At that size, Kepler-62f is within the range of planets that are likely to be rocky and possibly could have oceans, said Aomawa Shields, the study’s lead author and a National Science Foundation astronomy and astrophysics postdoctoral fellow in UCLA’s department of physics and astronomy. NASA’s Kepler mission discovered the planetary system that includes Kepler-62f in 2013, and it identified Kepler-62f as the outermost of five planets orbiting a star that is smaller and cooler than the sun. But the mission didn’t produce information about Kepler-62f’s composition or atmosphere or the shape of its orbit. Shields collaborated on the study with astronomers Rory Barnes, Eric Agol, Benjamin Charnay, Cecilia Bitz and Victoria Meadows, all of the University of Washington, where Shields earned her doctorate. To determine whether the planet could sustain life, the team came up with possible scenarios about what its atmosphere might be like and what the shape of its orbit might be. On Earth, carbon dioxide makes up 0.04 percent of the atmosphere. Because Kepler-62f is much farther away from its star than Earth is from the sun, it would need to have dramatically more carbon dioxide to be warm enough to maintain liquid water on its surface, and to keep from freezing. An atmosphere that ranges in thickness from the same as Earth’s all the way up to 12 times thicker than our planet’s. Various concentrations of carbon dioxide in its atmosphere, ranging from the same amount as is in the Earth’s atmosphere up to 2,500 times that level. Several different possible configurations for its orbital path. They found many scenarios that allow it to be habitable, assuming different amounts of carbon dioxide in its atmosphere. Shields said that for the planet to be consistently habitable throughout its entire year, it would require an atmosphere that is three to five times thicker than Earth’s and composed entirely of carbon dioxide. (This would be analogous to replacing every molecule in Earth’s atmosphere with carbon dioxide, which means that the planet would have 2,500 times more carbon dioxide in its atmosphere.) Having such a high concentration of carbon dioxide would be possible for the planet because, given how far it is from its star, the gas could build up in the planet’s atmosphere as temperatures get colder to keep the planet warm. The research is published online in the journal Astrobiology, and will be in a future print edition. The scientists made their calculations of the shape of the planet’s possible orbital path using an existing computer model called HNBody, and they used existing global climate models (the Community Climate System Model and the Laboratoire de Me´te´orologie Dynamique Generic model) to simulate its climate. It was the first time astronomers have combined results from these two different types of models to study an exoplanet, the term for a planet outside our solar system. Scientists do not know whether life could exist on an exoplanet, but Shields is optimistic about finding life in the universe. More than 2,300 exoplanets have been confirmed, and a few thousand others are considered planet candidates, but only a couple dozen are known to be in the “habitable zone”—meaning that they orbit their star at a distance that could enable them to be warm enough to have liquid water on their surfaces, Shields said.